The Greater Amberjack (Seriola dumerili) named “Jack” (Tag ID: GFR9183) was originally tagged & released by angler Taylor Lapnow on January 7th, 2016 while fishing with Captain Bouncer Smith and mate Abie Raymond aboard the charter boat Bouncer’s Dusky 33, out of Miami Beach, Florida. The Amberjack was measured to be 23 inches (58.42 cm) total length. Angler Brett Heiken recaptured the Greater Amberjack 24 days later on January 30th, 2016 while fishing aboard the Back In Biz out of Haulover, Florida. During that time period, the Amberjack most likely stayed at a consistent water depth around some sort of structure (i.e. rocky reef or wrecks). 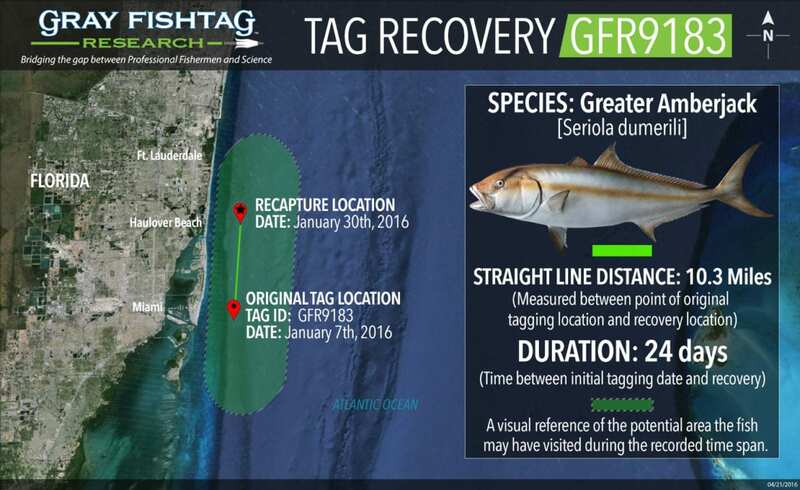 The recapture was in the waters off Sunny Isles Beach, approximately 10.3 miles north from the original tag location. At the time of recapture, the Amberjack had an estimated length of 27 inches and weight of 20 pounds. Bouncer’s Dusky 33 charter boat crew will receive some Gray FishTag gear for their tagging efforts. Tag recovery angler Brett Heiken will receive a pair of Costa Del Mar sunglasses, a Tag & Recovery Certificate, and Gray FishTag gear for reporting the tag recovery.